Advantages: Absorbing story of Axis reversals yet unprecedented personal successes; concise and interesting narrative; large, relevant photos; great profiles - terrific inspiration for modellers. If 1942 was a year of stalemate, 1943 was the first year of undeniable Axis decline. And nowhere else was this decline more obvious and more catastrophic to the German Armed Forces than on the Eastern Front. The new year dawned with the disaster of Stalingrad and, despite some successful counterattacks and defensive encounters during the year, the giant resources of the Soviet Union were finally in harness - on the ground and in the air - to eventually grind the Wehrmacht all the way back to Berlin. After the stunning German aerial successes during 1941, the VVS clawed its way back in terms of personnel, skills and technology and, by 1943, the Soviet airman represented a far greater threat than ever before. Even so, the Jagdwaffe continued to enjoy successes, at least in statistical terms, and particular pilots were earning legendary status with remarkable tallies. For example, by the time the famous Erich Hartmann attained the total of 100 victories, this feat was no longer considered worthy of awarding the Knight's Cross as 50 other Luftwaffe pilots had already reached that milestone! Vol. Four Section 3, Jagdwaffe The War in Russia November 1942 - December1943, offers one of the best opportunities yet to showcase some wild variations in Luftwaffe fighter camouflage and markings. This period saw unprecedented improvisation of colour schemes, with greens, browns, tans and appearing in a wide range of combinations and patterns. Unique markings often complimented these interesting schemes. The book comprises 96 pages in the familiar large format (303mm x 206mm) of the series. The text deals with operations and personalities, and also briefly covers Rumanian and Spanish units operating in the sector. More than 180 photos, mostly of the fighter aircraft of the period, are one of the highlights of this title. Captions are detailed and relevant, and provide useful information about the colours and markings of the subjects. Tom Tullis provides 24 wonderful side profiles with some inspiring divergence from standard mid-war greys. If I could offer one criticism, it is that the main body text barely mentions camouflage and markings, the raison d'etre for the series. To be fair, the detailed captions and feast of profiles amply covers this subject, but I would have been interested in a little more detail about the colours and markings of the period in general, their origins and typical usage. 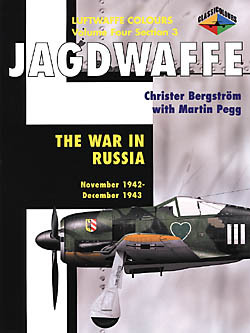 A wealth of well-reproduced wartime photos, attractive colour profiles and engaging text, makes Jagdwaffe The War in Russia November 1942 - December1943 another great source of inspiration for modellers in this ambitious series.